You want to learn how to fly? You are already a pilot and you want improve your flying skills? You want to discover another country and fly there? Take a look at our courses! Discover paragliding in tandem with one of our state qualified instructors above Chamonix valley and facing Mont Blanc! This will also be the opportunity for you to learn the basics of piloting.. 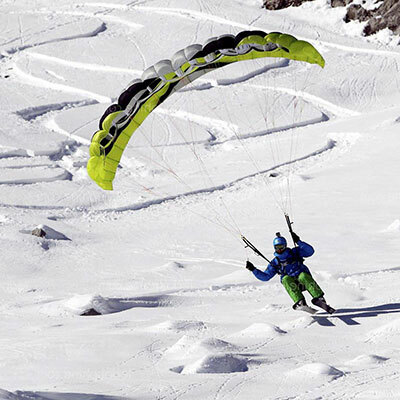 Speed riding is a new discipline that was born from the combination of several adventure sports, including paragliding, freeride skiing and snow kiting. 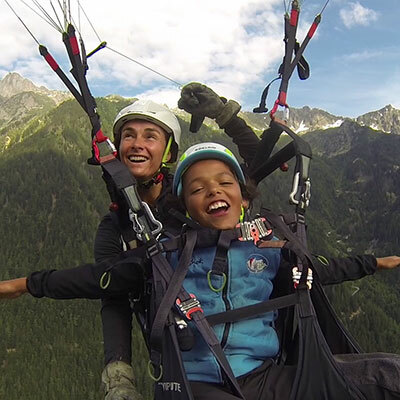 Offer a tandem flight facing the Mont Blanc! Valid for one year, the gift voucher is the good way to surprise your friends or family with a unique experience! We all share the same passion for flying, and we love to share it! Experienced teachers, young and highly motivated, competitors, mountain guide... click to know more about us!